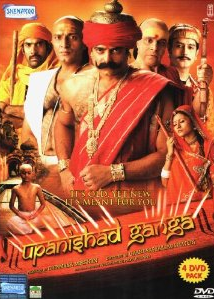 17th episode of Hindi TV Serial – Upanishad Ganga – is focused on Renunciation (in the context of the episode it is about dedicating one’s life to the greater good of the nation and society). Meaning: O Sun God, The Golden Vessel has concealed the Truth within, open it for me so I can explore it! Hindu way of living is quite broad in almost every aspect. That’s why it enforces that the entire life should be lived in 4 different segment to get the best of it. As a human being we all are gifted with brains. We can think, can save our thoughts in form of various media so they can be used as guidelines for future generations. As it is said by Chanakya, if you have to learn everything by experiencing it, then it is impossible. We need to learn from others’ experiences. And that is what it is called study. Grihasthashram (The age of enjoying family life and make the use of learning for the betterment of self and family). Vanprashtashram (The age of pushing the next generation to the front and let them take the charge, betterment of the society should be one’s motto at this stage). Sanyasthashram (The age of doing the things with selflessness. Do good for entire universe and keep getting rid of all the bonds one by one, and be free and get ready to accept the ultimate truth – the death). While Updanishad Ganga – TV Serial have explored “The Renunciation” in Episode #16 through the story of Vidyaranya; this episode explores the “selflessness and living all bonds behind for the betterment of the soul” through the story of Sage Yagyavalkya. King Janak (aka Janaka) of Mithila used hold conferences of intellectuals. His aim is to get a dip into the ocean of knowledge. The Shastratha or Q/A sessions are meant to get the best knowledge from everyone and try to find the best answer for some unanswered questions in one’s mind. But the things are not meant to remain ideal, right? In one such conference Janak have declared that whoever will win the Shastratha will also get 1000 cows from King as gift. And it is not all, each cow will have 10 gold coins attached to each of it’s horns! It is definitely a prize worth to fight for right? so everyone was ready to fight and it is going to lead to a chaos, obviously. Janak also understood that as each participant is knowledgeable, he is full of pride. The pride became arrogance and eventually rather than “searching for the truth“, there was “show off of the knowledge” in the conference. So he decided to keep it in line. So he announced that this is the prize for the one who consider himself as the best of them all. As Yagyavalkya saw no one have the courage to getup, he went ahead and asked his students to get hold of the cows and draw them to their Ashram! By seeing them, one of them Of course this didn’t went well with all the intellectuals present in the conference. Acharya Ashwal challenged Yagyavalkya (aka Yagnavalkya) that are you considering best and most devoted? Untill and unless you prove it, you cannot possess the gift meant for the winner. Yagnavalkya politely refuse to claim to be the best among them. He said that I am not considering myself as the best, but I am taking these cows with me because I need them! What happens this point forward brings a great lesson. So I would suggest you to explore it by watching the episode. Though I would like to mention that, sage Yagyavalkya had two wives Katyayani and Maitreyi. While Katyayani was young and less experienced, Maitreyi was mature. Both their interaction with Somshrava, who was a messenger to unleash the news of Yagyavalkya’s victory and the prize he earned, explores their personalities pretty nicely. The life is what we make of it. Yes, it is complecated, but it is not that complicated as well. If you apply the knolwedge, wisdom and intelligence, what you need is simplifying the things. If you simplify the stuff and get the answers to basic stuff. The entire vision would be clear without a doubt. This is what this episode tries exploring and it explores it pretty well. In terms of acting K. K. Raina is the top performer of the episode. He is a fantastic actor and there are no two thoughts on it. His body language, his dialog delivery, his expressions, everything is a delight to watch. He can show each emotion on his face pretty effectively. While the actresses playing Maitreyi and Katyayani are not fantastic ones, they are convincing for sure. Their dubbing is done nicely. The actor playing Ashwal knows his job and stands tall in the dual. The script is the real hero of course. The characters and incidents are written so well that, they create the desired impact. The dialogs are simple and effective. There was a chance to have heavy and philosophical dialogs which may be tough to understand and digest. However, the script writers did a brilliant job and made thing things simple. And that is what this episode is conveying as the central thought. The sets and locations are quite realistic and so do the wardrobe. Otherwise, when watching the fantasy drama or mythology stuff, we see splendid, larger than the life stuff. While splendid stuff is good to view, people may not relate it with them, as it is almost in contrast of the things, possessions and environment, the majority of us are living in. The video quality is good and The dubbing quality is great as well. Almost each episode of the TV Serial is now available on Youtube to watch for free. However, it is good to have DVD set of it and you can watch it anytime you need to understand the life better, regardless of internet connection and/or its speed. Definitely worth to go for episode. It is value for money and most importantly time you spend to watch it.